Our product range includes a wide range of flow cup viscometer - ford cup, inspection mirror, led telescopic inspection mirror, magnifying lens, surface profile gauge and testex snap gauge. We are distributor & trader of Flow Cup Viscometer - Ford Cup. We deal with supply of flow Cup Viscometer (Ford Cup). 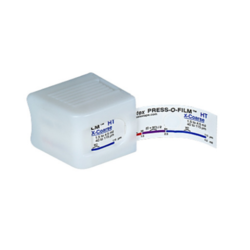 This is an appliance to ascertain the viscosity levels of fluids like water, grease, oil and others. To measure the viscosity level of liquids like lubricants, high capacity viscometers also known as rhemoters are used. Our viscometers are extensively used in Paints, chemicals, lubrication and other liquid processes. We are distributor & trader of Inspection Mirror. Welding inspection mirrors are known for their seemingly limitless uses both around the home and in the shop. For instance, an telescopic inspection mirror can be used to check behind an armoire for lost keys or beneath an engine block for a missing bolt. Welding inspection mirrors are popular for welding inspection as gives precise information about weld. Welding inspection mirrors come in a variety sizes and lengths, and feature dual ball-and-socket joints for infinite angle adjustments of the mirror. These telescopic welding inspection mirror has extension to reach long. All types of inspection mirrors rectangular, oval or rectangular and also magnetic pick sticks are also supplied in india and abroad. We are leading supplier & trader of LED Telescopic Inspection Mirror. All-angle ball joint holds lighted mirror head firmly at any angle for perfect viewing. 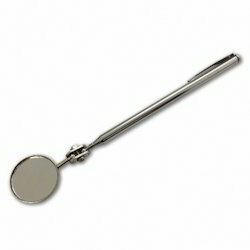 Stainless steel handle is long, strong, and lightweight for fast accurate inspection. LED Telescopic Inspection mirrors are known for their seemingly limitless uses for automotive and industrial applications. This inspection mirror is perfect to be used to look under tanks, machinery and vehicles without getting down on the floor. Easy operation in dark areas or night time. 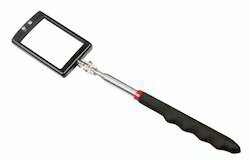 Telescopic Inspection Mirror is a great combination tool that allows you to inspect areas under machinery, automobiles and other equipment, and more easily pick up items that have fallen or rolled underneath. Also available round or rectangular sizes. We are leading supplier & trader of Magnifying Lens.Standard Model has external springs and a 130 mm clear view glass lens with shadow free 22 watts circular lamp illumination. This is the most popular 'value for money' model, available ex stock and used in large numbers on manufacturing and assembly lines.Lens: Specially designed, distortion controlled high quality lens correctly sized for both eyed (bi-ocular) vision. Clear Diameter: 130 mm, 3.2D lens. Provides about 4 times area magnification. Working clearance below lens mount is 250 mm, and field seen can be up to 250 mm. Illumination: 22 watt standard circular fluorescent light providing shadow free, bright illumination. Stand: Highly optimized design , spring balance stand with feather-touch movement to place lens in the correct position and orientation. Lens center can reach out 900 mm in front of mount axis with up to 360 degrees swivel. We are supplier & trader of Testex Snap gauge.The Testex Snap Gauge is used for the measurement of the surface profile after blasting when taken with Testex Tape / Replica Tape / Press-O-Film.Testex Tape or Press O Film offers a simple and very accurate method of measuring blasted profiles. It can produce virtually exact replicas of the blasted surface profile, which can be measured using a snap gauge.Hand Held simple operation. Place the Testex film firmly on the blasted surface, apply moderate pressure with the burnishing tool, the replica has now been taken and can be measured using the textex snap gage. Highly useful tool for measurements and used for pipeline & coating inspection.Complies with ASTM, NACE and SSPC methods of measurement.The Press-O-Film snap gauge can also be used as a micrometer for checking calibration test pieces and also thickness of flakes of paint. We are supplier & trader of Testex Tape. Testex Tape is popularly called as Press-O-Film. Press-O-Film provides surface profile of a basted cleaned surface. It can produce virtually exact replicas of the blasted surface profile, which can be measured, using a snap gauge. Testex tapes offers a simple and very accurate method of measuring blasted profiles of surface. Testex Tape / Press O Film consists of layer of crushable plastic microfoam coated onto a polyster film of highly uniform thickness. Testex Tape is supplied in a roll containing 50 tests and is available in four different grades to cater for different applications. The snap gauge is supplied in a carrying case with a burnishing tool. Testex Tape (Press-o-film) complies with ASTM, NACE and SSPC methods measurement. ASTM- Reproducibility is given in ASTM Standard 4417-93 for both “X-coarse” and “coarse” grade replica tape. NACE- Standard RP0287-95 addresses the issue of accuracy of measurement, test results. > Standard ISO8503-5 describes preparation of steel substrates before application of paint and related products. We are the leading Manufacturer, Wholesaler, Dealer and Exporter of Adhesive Tape. Wet Film Thickness Gauge hexagonal precision formed stainless steel wet film combs are long lasting and reusable and are supplied in a range of thicknesses. Their six-sided combs vary in size, giving either 24 or 36 measurement steps, depending on the comb, providing increased accuracy. Place a comb perpendicular to and touching the substrate. Hold the comb in position and wait a few seconds until the teeth are wet. 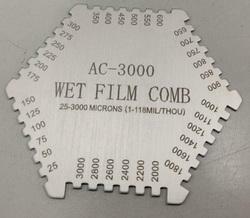 Remove the comb from the film. The wet film thickness lies between the biggest value 'coated' or 'wet' tooth and the smallest value 'uncoated' or 'dry' tooth. We are distributor & trader of Dust Evaluation Tape Dustiness Tape. Dustiness tape also known as dust tape test kit or dust evaluation kit is recommended tape and magnifier to be used for assessing the amount of dust on blasted steel surfaces, which have been prepared for painting. It is also known as test for assessment of surface cleanliness. 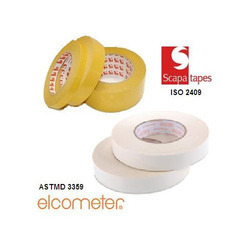 Dustiness tapes provide pictorial ratings for the assessment of the average quantity of dust as well as descriptive classes for the assessment of the average size of the dust particles. The method is based on pressing a pressure-sensitive adhesive tape on to the steel surface to be tested. Dust evaluation tapes are used to carry as a "pass/fail" test by comparison with specific limits or by permanently recording the dust present on a surface by mounting the tapes. The tape is pressure sensitive, transparent and correct adhesive strength greater than 190 N / meter to comply with the standard ISO 8502-3. Dust on blast cleaned steel surfaces may reduce the adhesion of applied coatings and by absorbing moisture, may promote the corrosion of the blast cleaned steel. Both the viewing lens and tape are detailed in the ISO 8502-3 standard. This being a visual method of evaluation it is very easy and useful test. The importance of dustiness tape evaluation is also specified in ISO 8501-1 for preparation of steel substrates before application of paints and related products. 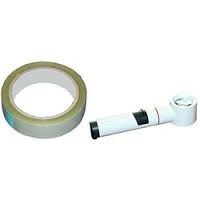 Tape length is supplied in 60 meters rolls.complete dust tape test kit is supplied along with tape, chart and magnifier.